Handcrafted Original House Portrait – the Ultimate Closing Gift! When it comes to real estate closing gifts, what better way to keep you on your client’s mind for future referral and repeat real estate business than a tastefully presented 100% original work of art that will proudly hang on your client’s wall to be viewed and enjoyed each and every day throughout the coming years and decades? 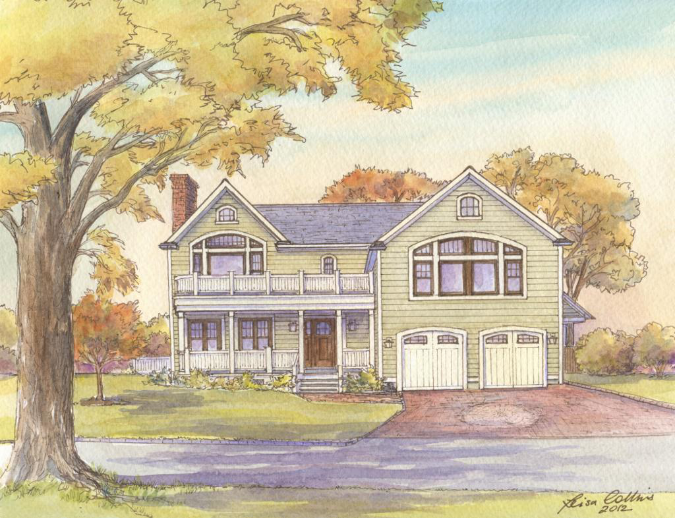 An original handcrafted house portrait is the ultimate closing gift! My Real Estate Closing Gifts are 100% Satisfaction Guaranteed! I can guarantee 100% customer satisfaction simply because that is what I experience from my clients 100% of the time. Hundreds of satisfied clients across the country can attest to this. This interview from my realtor client, a multi-million dollar top producer who is in the top 1% nationally, says it all! Laurie Mensing has now requested Leisa Collins custom house portraits as closing gifts for 30 of her clients. Furthermore, she is the #1 sales agent in Long & Foster McLean (as of 2016). She’s “Best of” in the Washingtonian (2015 & 2016) and a “Top Real Estate Agent” in the 2016 Northern Virginia Magazine. Laurie has excellent reviews from clients and is a “Zillow 5-star agent”. Her clients praise her sincerity, honesty and attention to detail and describe her as a realtor who will always go the extra mile. Why is giving a custom house portrait such an ideal closing gift? 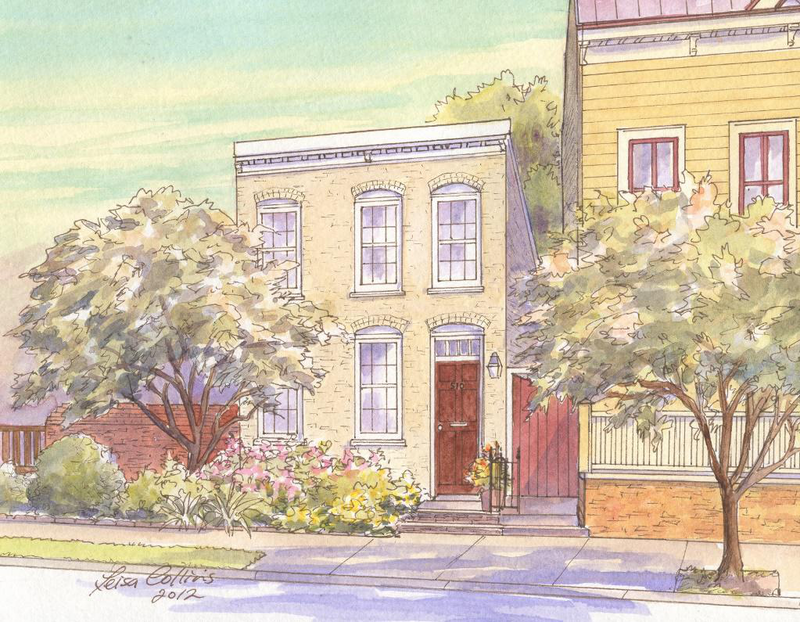 What particularly stands out to you about a Leisa Collins house portrait? It is professional looking while not looking “generated” like many portraits. The colors and style lend itself to be framed in a traditional or contemporary style. What is the reaction of your clients when you present the portraits to them? Do you feel that a house portrait results in further business? Truthfully, I have never thought of a closing gift in this manner. However, in terms of referrals from clients I have given portraits to, then the answer is yes! Special price offers for realtors. I offer a 15% discount to real estate agents for my framed and matted house portraits. 9 x 11 inch (size of original) with mat and backing board (total size is 11 x 14 inches so it fits a standard size frame.) Sent to you in a cellophane presentation sheath. 12 x 15 inch (size of original) with mat and backing board (total size is 16 x 20 inches so it fits a standard size frame.) Sent to you in a cellophane presentation sheath. Tax is included. There is an additional cost for packing and shipping which is typically $30. The average time it takes to complete the painting is two – three weeks. My original house portraits are hand drawn and painted from good quality photographs which real estate agents are able to supply more often than not. Every season has its own delights, but sometimes the photographs available don’t depict the home at it’s finest. I am experienced at tailoring the final home painting to the season desired. 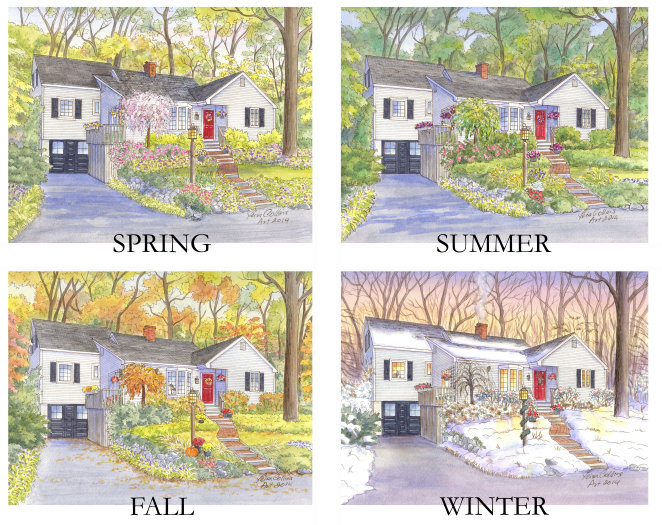 See examples of a single home shown in four different seasons below. Contact me to get any questions you may have answered or to discuss any particular homes that you have in mind for a real estate closing gift to your new home owners. Remember, an original house portrait painting given as a closing gift to your new home owners will last virtually forever and they will be reminded of your thoughtfulness on a daily basis throughout the years to come. And for you that means referrals and repeat business! Give me a shout today. Click here to visit my contact page.